“Young people have been the hardest hit by Fianna Fáil’s mismanagement of the economy. Fine Gael is offering them an alternative“ says Fine Gael leader Enda Kenny TD in 2009. Flickr/ EPP. Some rights reserved. In 2008, Ireland became the first Eurozone member to enter recession. Between 2007 and 2010 the economy contracted with a peak-to-trough decline of 12.4% of GDP, and tax receipts fell by 33%. The crisis was precipitated by the bursting of a property bubble, the collapse of the construction industry in which 1 in 9 people were employed, and a liquidity crisis in the country’s banks. In what would become the most expensive bank rescue since the Great Depression, in autumn 2008 the state moved to guarantee the liabilities of the six biggest financial institutions. The guarantee cost the taxpayer €64 billion, or 37.3% of GDP, the highest proportion of any EU country, even ahead of Greece which spent 24.8% of GDP on its banks. The public finances never fully recovered, and financial markets failed to regain confidence in the Irish government’s ability to service its debts. The country was driven to the brink of bankruptcy, and in November 2010, it became the second Eurozone member after Greece to seek a bailout from the Troika, agreeing to the terms of a four-year €67.5 billion rescue package. The then finance minister, Brian Lenihan Jnr, having been named the worst finance minister in Europe for 2009 and 2010 by the Financial Times, died of a short illness the following June. Three years later in December 2013 Ireland became the first country to successfully exit its bailout programme. In the last general election in February 2011 the incumbent Fianna Fáil (centre-right) and Green party coalition was routed. Fianna Fáil, long regarded as the natural party of government, having held office for more than 60 of the previous 90 years, was swept from power, losing 51 of its 71 seats in the 166-seat parliament. Their smaller coalition partners the Greens lost all of their six seats. The Fine Gael (centre-right) and Labour (centre-left) grand coalition government was elected with a combined haul of 113, the biggest mandate in history. While in several crisis-stricken countries in Europe, the pressures of administering austerity brought about the collapse of governments, the Irish coalition ran its full five-year term relatively unscathed, with Fine Gael losing ten deputies through defections, and Labour losing four. While Fine Gael’s vote share is expected to fall, it will almost certainly emerge as the biggest party after the election and is expected to lead the next government. 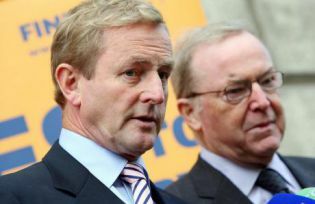 Should Taoiseach (Prime Minister) Enda Kenny succeed in doing so, he will become the first Fine Gael leader to achieve successive election victories. Labour meanwhile are expected to retain fewer than a quarter of the 37 seats they won in 2011, mirroring the fate of many smaller coalition parties across Europe, such as the Liberal Democrats in the UK and the Free Democrats in Germany. With a week left to the election, the Irish Times poll of polls estimates support for Fine Gael at 28.5%, Labour at 7.5%, Fianna Fáil at 19%, Sinn Féin (centre-left) 19.5% and Independent and smaller parties at 23.5%. These numbers indeed anticipate a Fine Gael victory, but when combined with the predicted reductions for Labour, the coalition will likely fall short of a majority, leaving open the question of who Fine Gael will govern with. Meanwhile, the rise in support for ‘Independents and others’ and for Sinn Féin are arguably the two most notable developments in this election. Significantly, given Ireland’s proportional voting system and its multi-seat constituencies, with no threshold for entering parliament, independents and smaller parties have long been a feature of national politics. However, polls suggest that the number of ‘independents and others’ may rise from 14 elected in 2011, to as many as 35 in Friday’s poll, aided in part by the emergence of the Social Democrats (centre-left) as a breakaway from Labour, and Renua (conservative), as a breakaway from Fine Gael. Nonetheless, smaller parties and independents will also be too few in number to govern alone, although they may be called upon to bring a potential coalition over the line. Similarly, support for Sinn Féin has surged from 9.9% in 2011 to as high as 19.5% in recent opinion polls, but support for the party has dipped to around 15% as polling approaches. While elsewhere in Europe the crisis years have seen the emergence of radical, populist, anti-establishment, and Euro-sceptic parties, no such group has emerged in Ireland. Sinn Féin is the oldest party in the country having been founded in 1905, and has held seats in Parliament continuously since 1997, and has governed in the Northern Ireland power-sharing Executive at different times since 1998. Sinn Féin is unlike the newer challenger parties emerging elsewhere in Europe such as Syriza in Greece or Podemos in Spain, given its heritage and longevity. It is clear furthermore that while Sinn Féin’s star has been rising over the crisis years, it is unlikely that the party will participate in government, this time at least, as each of the mainstream parties have claimed that they will not govern with the party, given its roots in the armed struggle against British rule in Northern Ireland. While Ireland is used to coalition governments, it is distinctly possible that no combination of parties will have the numbers to govern after Friday’s poll, as happened following the general elections in Spain in December 2015, and new elections may be called. Fine Gael has ruled out a coalition with Fianna Fáil, Fianna Fáil has ruled out Sinn Féin, and Sinn Féin has ruled itself out of any coalition where it is not the biggest party. However once the chips are down, it is impossible to tell what the parties may be willing to do in order to gain power. Essentially the Fine Gael/Labour government is seeking to be re-elected on its record of competence, and from having charted a course through the difficult crisis years. While the coalition has stayed the course for its full term, the implementation of five years of austerity has made the government deeply unpopular and unlikely to be re-elected, on its own at least. Many commentators are beginning to speculate seriously about the prospect of what until even very recently was regarded as unthinkable in Irlsh politics, namely the formation of a Fine-Gael/Fianna Fáil coalition. These parties, the heirs of two sides of a bitter Civil War fought almost a century ago, have each repeatedly and sometimes vociferously ruled this out. However, this year, which marks the centenary of the 1916 Easter Rising, the seminal event in Irish social and political history that began the process that would lead to Irish independence, may provide the historical justification for ending one of the great taboos in Irish (and European) politics. Failing this, Ireland may be entering a phase of unprecedented political instability following the election next week. Given these trends, it is clear that Ireland is experiencing a realignment of its political system, with the erstwhile dominance of the two big ‘Civil War parties’ of Fianna Fáil and Fine Gael as well as the traditional ‘third party’ of Labour being joined by a rapidly growing Sinn Féin, and the rise of six or seven smaller parties and independents which may prove to be systemically significant. Barry Colfer is a doctoral researcher in European politics at the University of Cambridge.